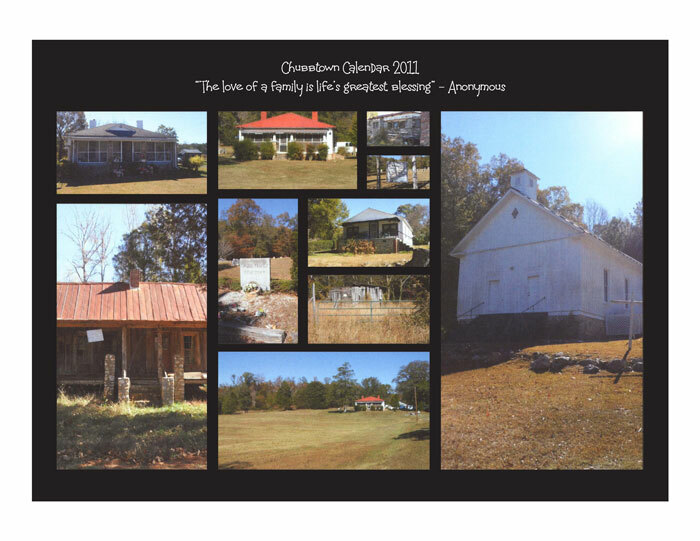 The Chubb Chapel United Methodist Church family would like to thank you in investing in the ongoing maintenance and beautification of the church by purchasing the Chubbtown Calendar for 2011. Chubbtown was a self-sufficient African American community founded pre-Civil War during the mid 1800's. Eight brothers migrated from North Carolina to develop the community and build Chubb Chapel United Methodist Church. Today, Chubb Chapel United Methodist Church, constructed in 1870 and located on Chubbtown Road, and a few homes are the only standing structures that were a part of the community, which covered over 1280 acres of land in Floyd and Polk Counties. The church, located on the National Registry of Historical Places, is considered significant architecturally because it is an example of a small vernacular Gothic Revival-style, country Methodist church build after the Civil War. The calendar features standing structures including the church, homes, barns, and storage facilities of Chubbtown. These structures were built during the late 1800s through mid-1900s. Other standing structures in the Chubbtown community and of relatives who were faithful members of Chubb Chapel United Methodist church, not featured in the calendar, include the homes of Edward and Louise Batey Chubb and Henry (Sonny) Chubb, and the farmplace of Homer and Jessie Mae Brown. The members of Chubb Chapel welcome you to visit the church. The church is operational for service on every second and fourth Sundays at 11:00 a.m. For further information, please write Chubb Chapel United Methodist Church, P. O. Box 771, Cave Spring Georgia 30124. The calendar was inspired by Rev. Elliott Sams and designed and developed by Tamara Whatley. The calendar is 8-1/2 by 11 inches in size. Calendars will be shipped via United States Postal Service, flat.